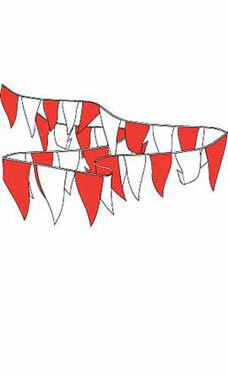 Bring in the crowds to your next sale or special promotion with Red/White Pennants. Pennants can add excitement to special activities or attract attention to your business year-round. The pennants are constructed of 4 gauge polyethylene plastic. The strand consists of 48 alternating red & white 12"W x 18"L pennants double-sewn on sag-resistant, braided nylon cord. Total length of pennant cord is 105’.